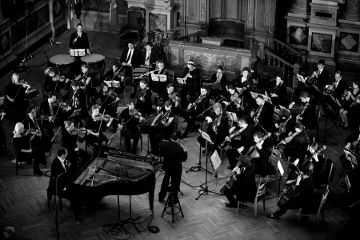 The Vienna Schubert Symphony Orchestra is an established Viennese institution which has been regularly performing traditional symphonic repertoire on one hand and special cross over projects on the other. The traditional repertoire includes symphonies, operas as well as smaller ensembles performing chamber music. However, what sets us apart from other orchestras are our special international projects: we have regularly performed in theatre productions at the Vienna Burgtheater and have recorded and appeared in a major Bollywood Production in India; the composer of the soundtrack being the Oscar award winner A.R. Rahman. There has been a series of such exciting projects in the past which has added to our growth, giving us the opportunity to learn from different partners and cultures. The coming year has several exciting projects in store for us: For the New Year 2013, we will undertake a concert tour to China. In March George Bizet's opera, Carmen will be performed at a fort in India; in this performance, Carmen is not a French gypsy- she is Indian- this will be an interesting intercultural exchange.